I just have always felt that the no-no-no-no-no signs don’t work and only annoy the nice people. That said, gardeners want to send messages to people who might just not “get it”, so we’re developing some fun signs that you can use on your garden. Feel free to adapt at will. Here are some examples. They’ll be completed by November 30, the windup for the west side Neighbourhood Small Grant party. Come and learn several techniques for creating birds (peace doves) for Christmas or Solstice trees from recycled plastic. We will create some simple birds using tin snips and sharpies. Mary will demonstrate and discuss techniques for using other tools such as a heat gun for fancy birds. 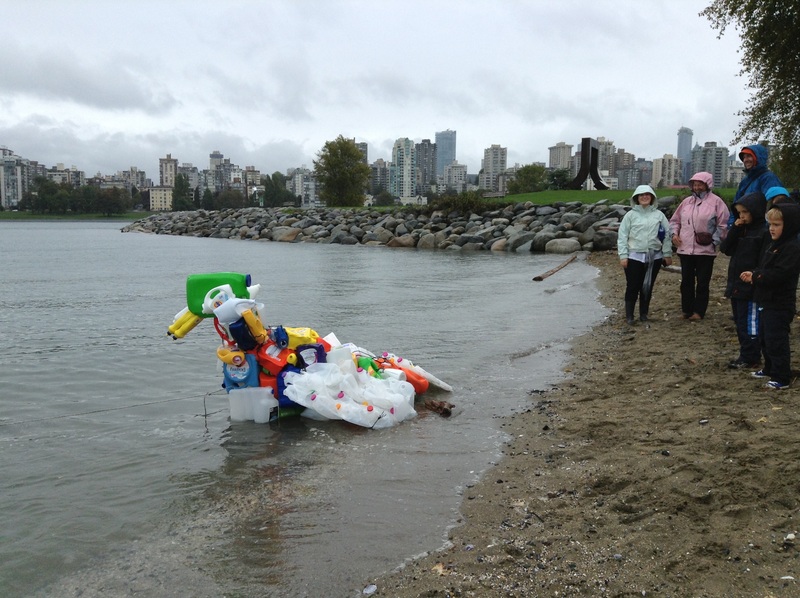 She’ll show examples of other art made from recycled plastic to inspire your creativity. 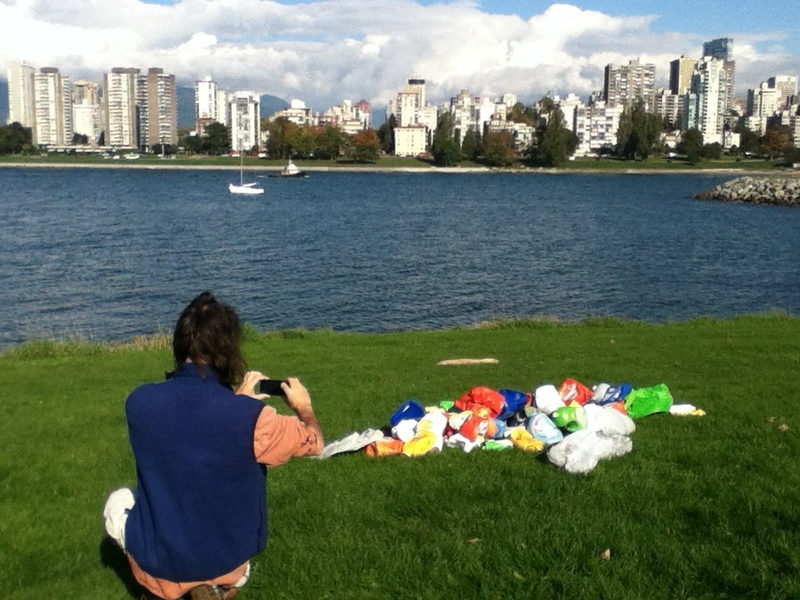 You’ll meet some neighbours, have some fun and learn some things about recycling and art-making. 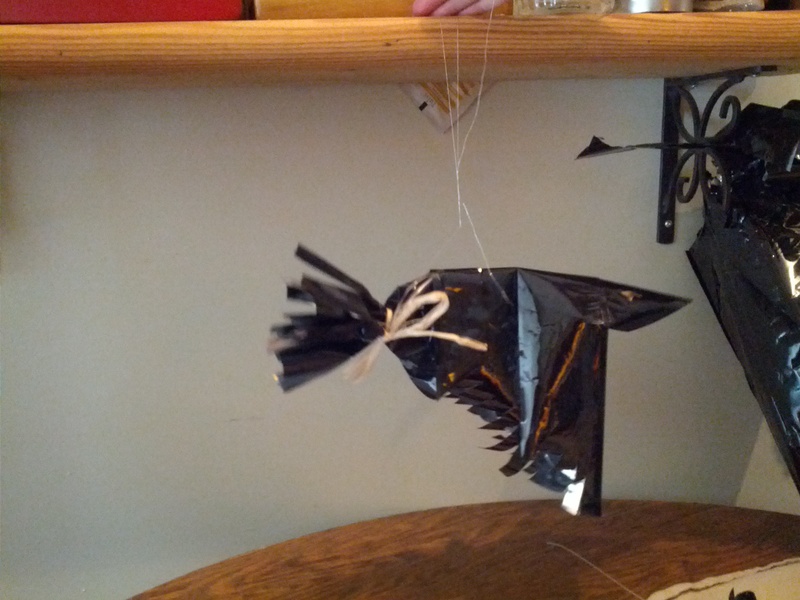 We’re making crows from coffee bags. If you plan to be a witch for Hallowe’en here’s a great way to create your personal familiar. Fold lengthwise, and cut along one edge. centre and pull it out. This will be your crow’s head. Pull out the triangle for the head, and fold along the middle. Cut out wings and tail. Clip along to make a fringe/feathers on both as you wish. I tied a raffia bow on his tail. I punched two holes in the top and threaded some fishing line through so I could hang him. Then I punched hopes for eyes. This is your basic bird. Yours might have further enhancements. 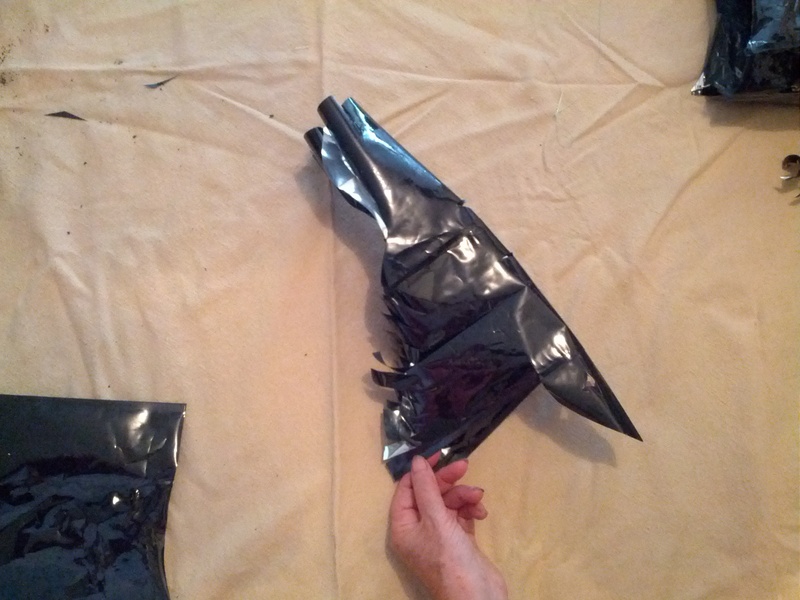 The coffee bags are not recyclable because they are plastic and foil fused together. our experience is that coffee shops are eager to have them transformed into art. Lessens the guilt factor. Stay tuned for spiders and bats. Maybe even black cats. I admit I’ve gotten a little obsessed with plastic lids – egged on by friends who are literally going through recycle bins to remove them and collect them for me. Several artists have created art and I’m incubating what I’ll do. The most likely focus is rangoli for Divali and/or Holi. If you google “plastic bottle cap art projects” you might find some projects to inspire you. 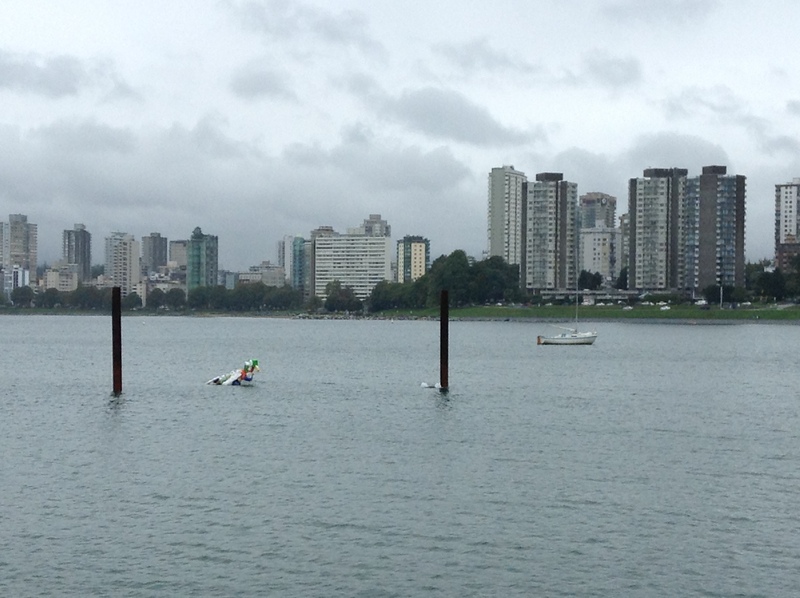 Early Tuesday I had a call from Bruce who lives at Heritage Harbour: The bird has flown away home. 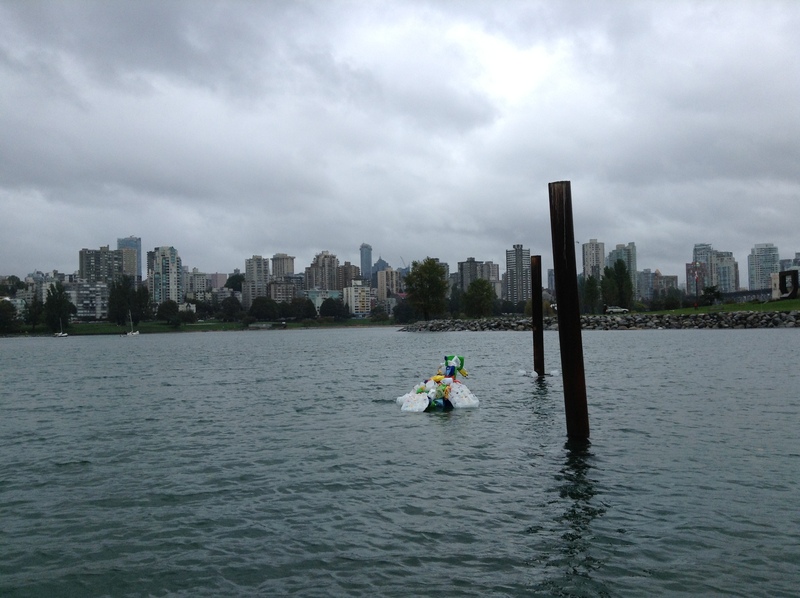 And not long after,he’s at the beach behind the parking lot near the Vancouver Maritime Museum. We were surprised at how scratched up and torn apart his “bones” were. Here are some photos of PETE laid to rest. 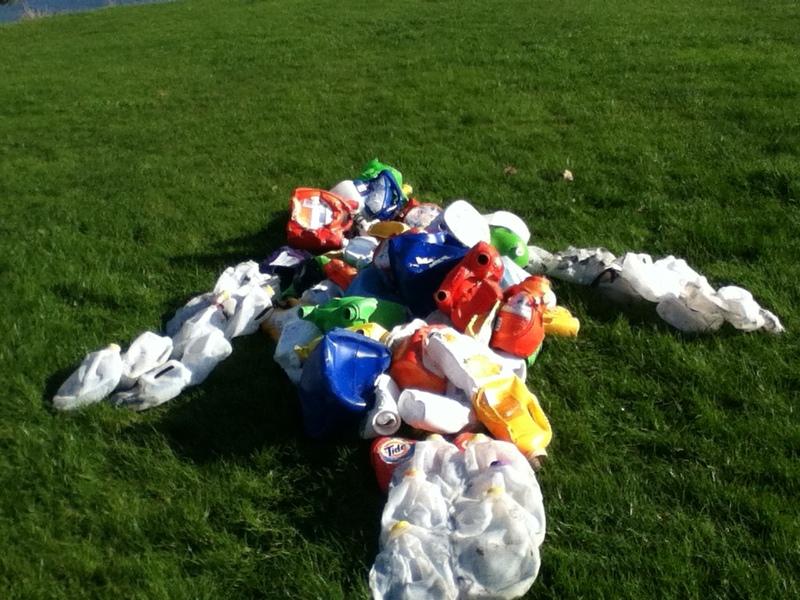 He is being recycled – a green burial. PETE. 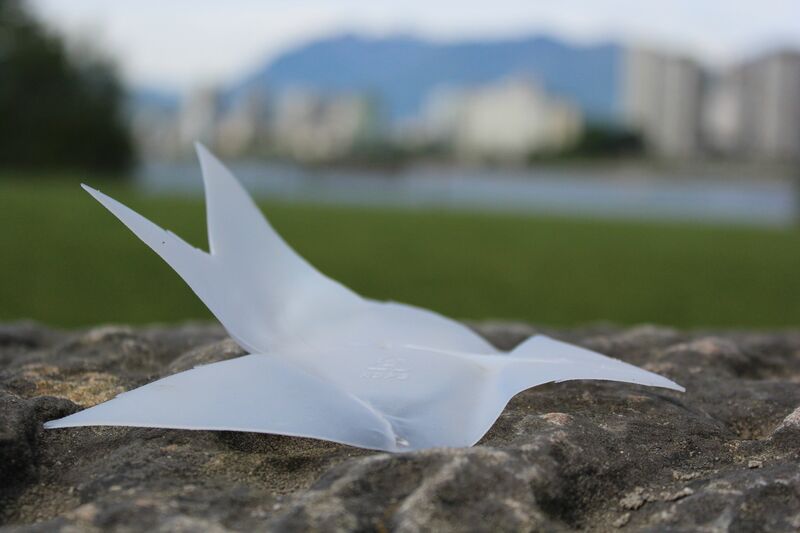 the PolyEthelene Bird, is Swimming in the Harbour. Have you wondered who are the people that look after the roundabout (traffic circle) and corner bulge gardens in our neighbourhood? 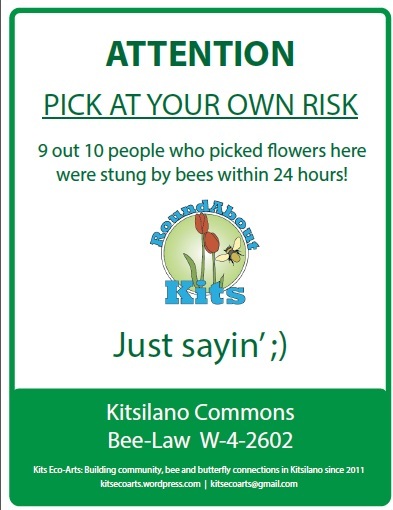 You can meet several of the Green Streets and boulevard volunteer gardeners on this walk “roundabout” Kits! 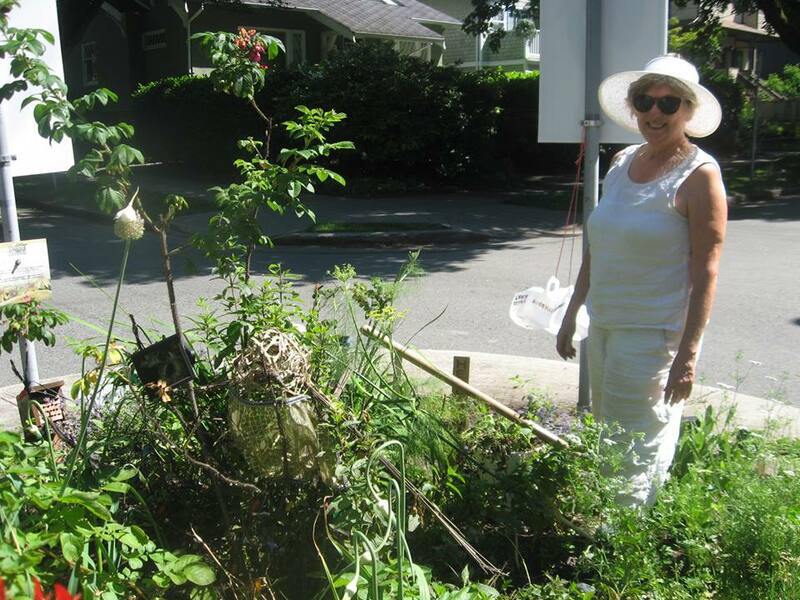 2pm Wired Monk -2610 West 4th – chat for gardeners who have received Neighbourhood Small Grants for their gardening projects. Hear about some upcoming projects too,like the boulevard near Wired Monk and a bench and Little Free Library coming to 2nd and Trafalgar. Check our my neighbour’s Pallet garden on Trafalgar between 5th & 6th -en route to the (famous!) Mary Go-Round About: Bring a bag and scissors – and help yourself to herbs! We’ll head to Lord’s Grace church 8th & Balsam where they’ve made a free herb garden from pallets (and some ingenuity). We’ll provide cheese and crackers and people can snip herbs to add. bee and butterfly corner bulge and best composition. Then we’ll head to Verdella and Gabriel’s garden at 10th & Yew. take us to rooftop garden. More snacks to enjoy while chatting with the Gardening Committee. Which laundry products are worst for oceans? 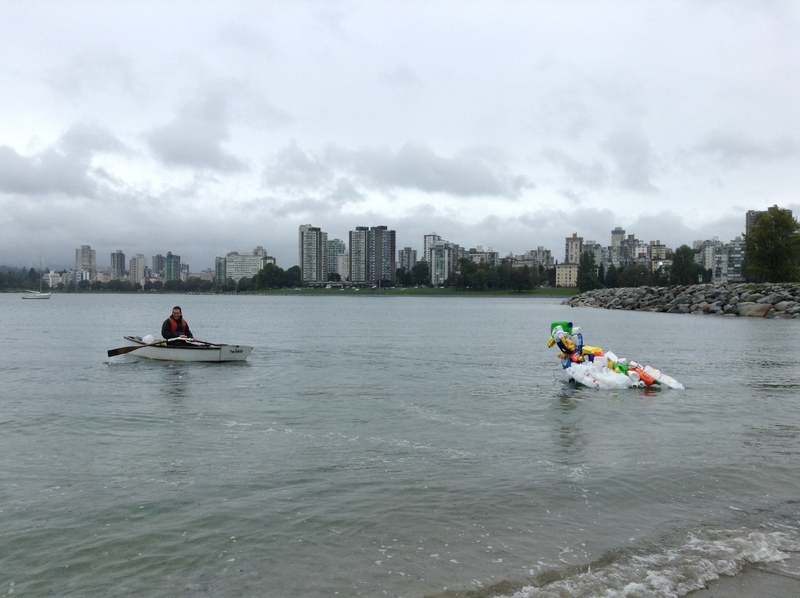 Did you know that several hundred Kitsilano residents have received Neighbourhood Small Grants for over 150 projects in the past three years? 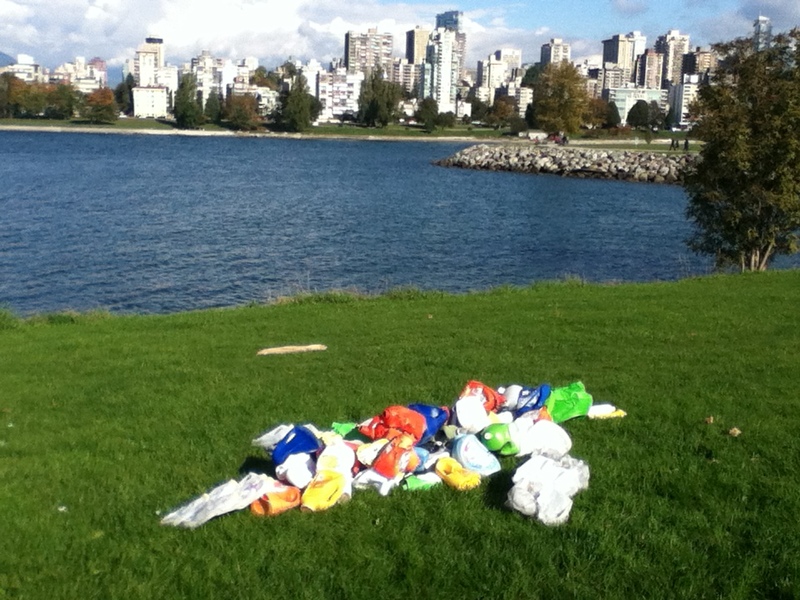 Some projects are one-time events (block party; permaculture blitz) or for a certain group (e.g. Residents on a particular block). Other grants support a project that will be ongoing for community connections. 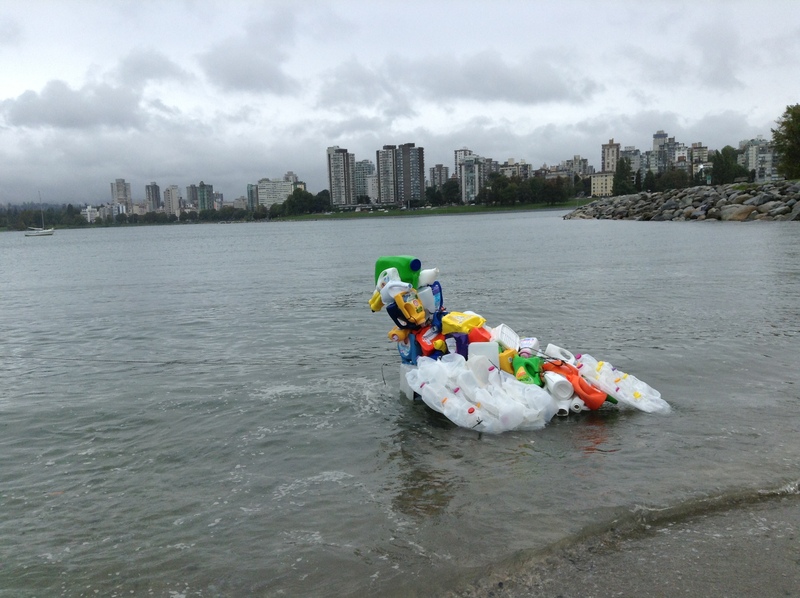 Several Kits residents who have received Neighbourhood Small Grants will be at the Kits Eco-Arts booth during Khatsahlano. The goal is to connect Art + Community + Environment.